Albert Einstein? Frederick S. Perls? Anonymous? A Great Astronomer? I find this quote hard to believe. Naturally, email and twitter did not exist in the time of Dickens, but even the telephone wasn’t deployed. Alexander Graham Bell received a patent for the telephone in 1876 and Dickens died in 1870. O! what a thing it is, in a time of danger, and in the presence of death, the shining of a face upon a face! I have heard it broached that orders should be given in great new ships by electric telegraph. I admire machinery as much as any man, and am as thankful to it as any man can be for what it does for us. But, it will never be a substitute for the face of a man, with his soul in it, encouraging another man to be brave and true. Never try it for that. It will break down like a straw. This quotation has been altered to obtain the shorter version that you give. Only one sentence from the story has been extracted for the quote. The pronoun referring to the telegraph has been removed, and the generic term “electric communication” has been substituted. Also, the male referents have been changed to genderless referents. In conclusion, substantial changes have been made to the original text to yield the widely-distributed single sentence quotation in its modern form. The dramatic life-or-death context has been excised. Yet, it is true that the words of Dickens did reflect skepticism toward substituting the telegraph for face-to-face contact in crucial situations. Update History: On April 8, 2014 the style of the bibliographic notes was updated to numerical form. Mark Twain? Charles Dudley Warner? Dear Quote Investigator: There is a classic Mark Twain quotation about the weather that I have used for years. However, recently I visited the Bartleby website and discovered that the reference work Respectfully Quoted: A Dictionary of Quotations says that the attribution to Twain may be incorrect. Someone named Charles Dudley Warner may have created the saying. Who is Charles Dudley Warner and who created the quote? QI: Your confusion is understandable and for many years the question of authorship for this quote was unresolved. But, QI has uncovered some new evidence that points to the most likely answer. Continue reading Everybody Talks About the Weather, But Nobody Does Anything About It. Posted on April 23, 2010 October 4, 2018 Categories Charles Dudley Warner, Mark TwainTags Chales Dudley Warner, Mark Twain, weather2 Comments on Everybody Talks About the Weather, But Nobody Does Anything About It. Have you ever enjoyed reading or hearing a clever quotation? Have you ever repeated the quote along with the attribution but wondered if the information was accurate? 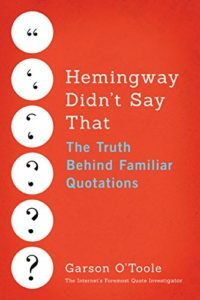 This blog tries to track down correct information about the provenance of sayings by utilizing the massive text databases that are being constructed right now along with other quotation history resources.